"I established the opposite view, that this history of the embryo (ontogeny) must be completed by a second, equally valuable, and closely connected branch of thought - the history of race (phylogeny). Both of these branches of evolutionary science, are, in my opinion, in the closest causal connection; this arises from the reciprocal action of the laws of heredity and adaptation... 'ontogenesis is a brief and rapid recapitulation of phylogenesis, determined by the physiological functions of heredity (generation) and adaptation (maintenance).'" 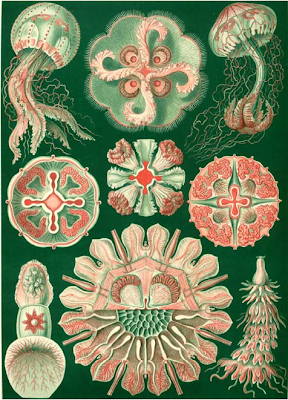 Haeckel, E. 1899. Riddle of the Universe at the Close of the Nineteenth Century. Ernst Heinrich Philipp August Haeckel (February 16, 1834 — August 9, 1919), also written von Haeckel, was an eminent German biologist, naturalist, philosopher, physician, professor and artist who discovered, described and named thousands of new species, mapped a genealogical tree relating all life forms, and coined many terms in biology, including phylum, phylogeny, ecology and the kingdom Protista. Haeckel promoted Charles Darwin's work in Germany and developed the controversial recapitulation theory ("ontogeny recapitulates phylogeny") claiming that an individual organism's biological development, or ontogeny, parallels and summarizes its species' entire evolutionary development, or phylogeny. 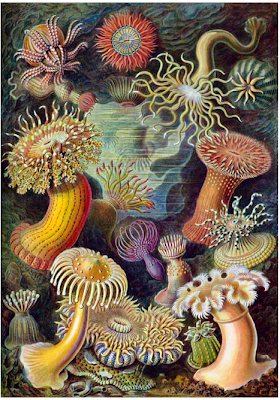 The published artwork of Haeckel includes over 100 detailed, multi-colour illustrations of animals and sea creatures (see: Kunstformen der Natur, "Artforms of Nature"). 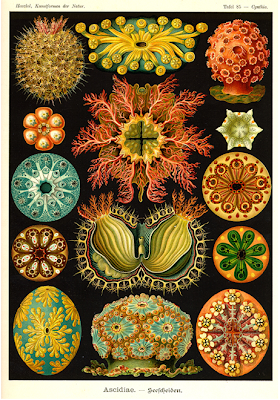 As a philosopher, Ernst Haeckel wrote Die Welträthsel (1895-1899, in English, The Riddle of the Universe, 1901), the genesis for the term "world riddle" (Welträthsel); and Freedom in Science and Teaching to support teaching evolution. In the United States, Mount Haeckel, a 13,418 ft (4,090 m) summit in the Eastern Sierra Nevada, overlooking the Evolution Basin, is named in his honor, as are another Mount Haeckel, a 2,941 m (9,650 ft) summit in New Zealand; and the asteroid 12323 Häckel. The Ernst Haeckel house ("Villa Medusa") in Jena, Germany contains a historic library. I love these amalgam, in your face compositions with out of this world insane color palettes. Even a duotone--no not black and a color, green and red...without going to brown as an option. And who knows how much of this stuff is real and how much a product of an active imagination? Maybe a trip to Cornell's Kroch Library to see if they have the original books? I am charged about this work. He is a treaure.